The entertainment includes an impressive line-up of top South African performers over the two days. These include Jesse Clegg, Jack Parow, Francois van Coke, Albert Frost, Crimson House, and the unique sounds of Manouche. The bar and the massive variety of local foody treats will keep visitors to the celebration well satisfied while they explore the farm on foot or bicycle, sample local wines, and immerse themselves in the beauty of Barrydale. The dam beckons hot campers to dive in or laze around on inflatable lilos with the hum of activity in the background. 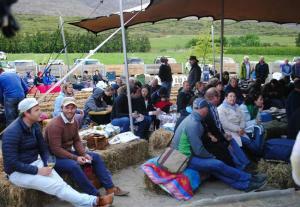 Don’t miss out on this exciting event, nestled in the valleys of Langeberg and Tradouw. Barrydale is about three hours from Cape Town. Venue: Joubert-Tradauw is a family-owned private cellar in the Tradouw Valley in the Klein Karoo region on the famous R62 route.